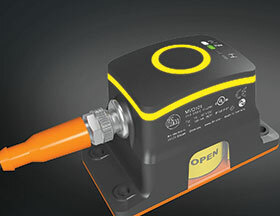 The intelligent valve sensor for pneumatic quarter-turn actuators from ifm electronic features 360° position monitoring to allow precise and continuous scrutiny of the valve condition. Problems such as wear or dogging are reliably detected and directly communicated to the user. This data supports maintenance planning and can also avoid production losses. Thanks to the integrated IO-Link communication interface and in combination with ifm IO-Link masters, the sensor can be networked via different bus systems, allowing connection to the ERP system. The IO-Link communication interface allows the identification of different wear conditions. On the one hand, the sensor features seal monitoring indicating a change of the closed position, which can point to deposits or wear of the seal, for example. On the other, the different positions can be counted and the time taken can be measured.